Visit my co-contributor here at The Liberty Papers, Stephen Littau. 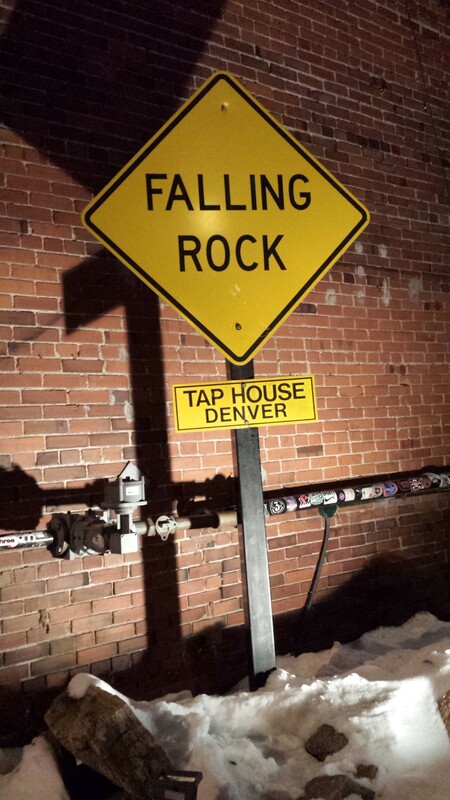 Visit my favorite beer bar, the Falling Rock Tap House. As it stands, I often get to do both at once, as I did this time. Of course, Stephen and I were so lost in conversation that I didn’t even think to have the waitress snap a shot of us enjoying our time there, so all I can offer is their sign outside. The Falling Rock Tap House has a motto: No Crap On Tap. And boy, do they ever live up to that motto. They have ~70 taps, and about ~70 bottled beers, and you won’t find Bud, Miller, or Coors on draft*. That said, extensive draft lists aren’t uncommon these days. What’s particularly impressive about the Falling Rock is that they really go to lengths to have a very well-curated, interesting beer list. About half of their offerings are local CO beers, with the rest being the best-of-the-best of what they can get their hands on nationwide. Yes, you will frequently find Russian River, Dogfish Head, Jolly Pumpkin, The Bruery, Lost Abbey, etc. And it doesn’t stop at the US border, with some good Belgian offerings. In addition, while (like any bar) they have a great collection of IPAs, they are not by any stretch of the imagination limited to IPA. They carry great examples of a wide range of beer styles. They have some amazing offerings during the Great American Beer Festival (and usually have a “Beer MC” to announce what’s being tapped because they move through beer so quickly during GABF). They have a number of yearly events, with their “Dain Bramage” strong ale & barleywine festival occurring during the cold** Denver winter. Finally, as it pertains to beer, they have one thing that many decent beer bars don’t have–servers who REALLY know beer. These aren’t waiters and waitresses that only know whether beer is dark or light. They can give well-informed descriptions and comparisons of beer. So if you’re new in town trying to figure out what obscure local Colorado beer to order, you’re in luck. In short, these guys know their beer. Outside of beer, they of course also offer food. I’ll be up front. The food is greasy bar food. That said, the food is extremely well-executed greasy bar food. I really like their deep-fried mushroom appetizer. It’s large button mushrooms, breaded in a mildly-spicy mix, deep-fried and served with dipping sauce. Simple? Yes. Tasty as hell? Absolutely. They make good burgers, sandwiches, wings, fries, etc. I generally consider myself to be a “foodie”. However, that doesn’t mean food has to be fancy. It just has to be good. And Falling Rock food is good. Last, but not least, is that Falling Rock is an excellent value. All the food is reasonably-priced, and beers are well-priced for the quality and rarity of the individual brews. Stephen and I had 5 pints between us, the fried mushroom appetizer, and each had a sandwich (a burger for him, pastrami sandwich for me). The total bill came out to ~$58. That’s very reasonable. If you’re ever out in Denver, I highly recommend visiting the Falling Rock. And having someone like Stephen to share your meal with is even better.